Above: Pendak Skirt with Woman and Sheep and Floral Motifs, Java, Indonesia, before 1923, Netherlands East Indies Period (1800–1942). Cotton, resist-wax print (batik). Newark Museum Gift of Dr. H. H. Rusby, 1923. Above left: Unknown, Portrait of a Beauty, late 19th century. 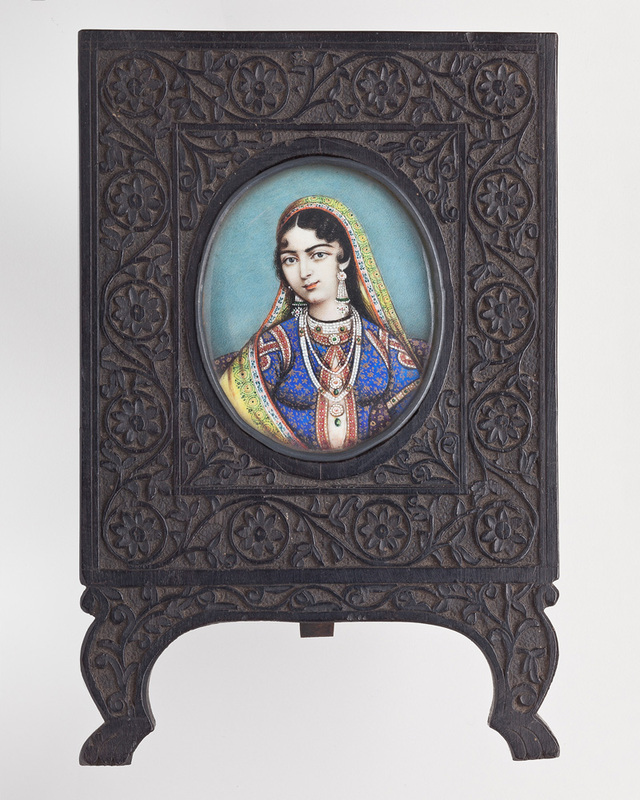 Colors and gold on ivory (painting), ebony, copper, glass (frame). Newark Museum Gift of Dr. J. Ackerman Coles. 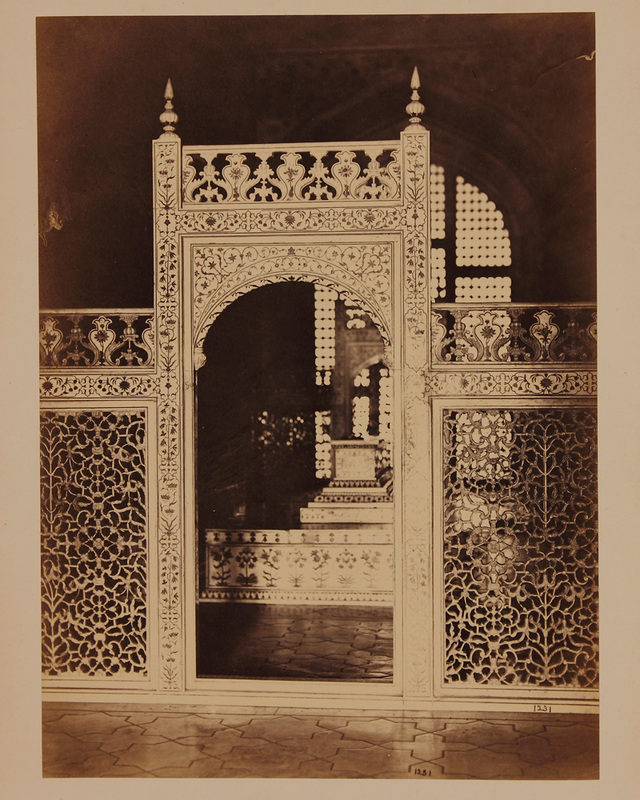 Above right: Unknown, Interior of the Taj Mahal (1631–48) in Agra. Newark Museum Anonymous gift. Curated by a team led by Katherine Anne Paul, Ph.D., curator of the arts of Asia at Newark Museum, the exhibition is structured around the Five Pillars of Islam, considered the core beliefs and practices of the world’s second largest religion. The Five Pillars are shahada (declaration of faith), salat (five daily prayers), zakat (almsgiving, or charity), sawm (fasting for Ramadan) and hajj (pilgrimage to Mecca). Each section of the exhibition showcases a range of objects from various countries and centuries, including works created in the service of Islam by Muslim artists for Muslim patrons, items created for purposes that are not explicitly religious and objects by non-Muslim artists created for both Muslim and non-Muslim patrons. 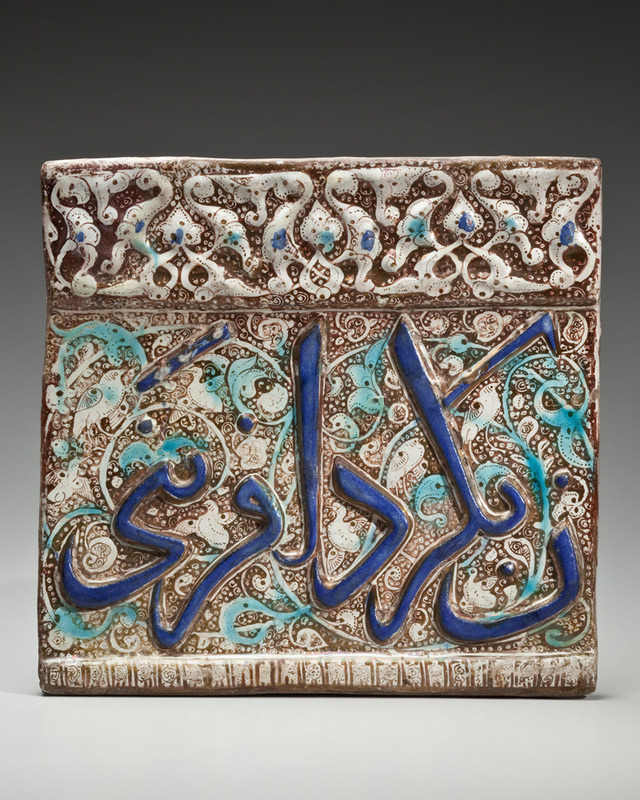 Above: Molded Luster Tile with Sentence Fragment in Raised Calligraphy, Floral, Avian and Geometric Motifs, Kashan, Iran, first half of the 13th century. Molded fritware polychrome painted over white slip under transparent glaze Newark Museum Gift of Herman A. E. Jaehne and Paul C. Jaehne, 1938. 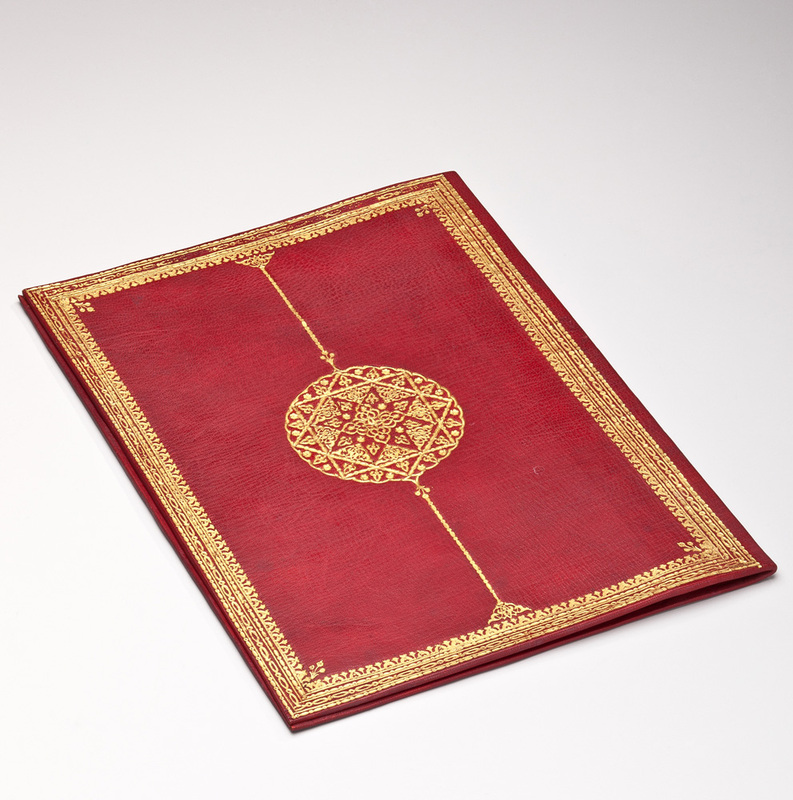 Featured works include books of poetry, woven prayer rugs depicting paradise, inscribed coffee pots, game boards and musical instruments. These traditional objects are displayed alongside contemporary works, such as calligraphic Sufi poems and sculpture, to demonstrate how artists today continue to explore through various mediums the ways in which art and Islam intersect. 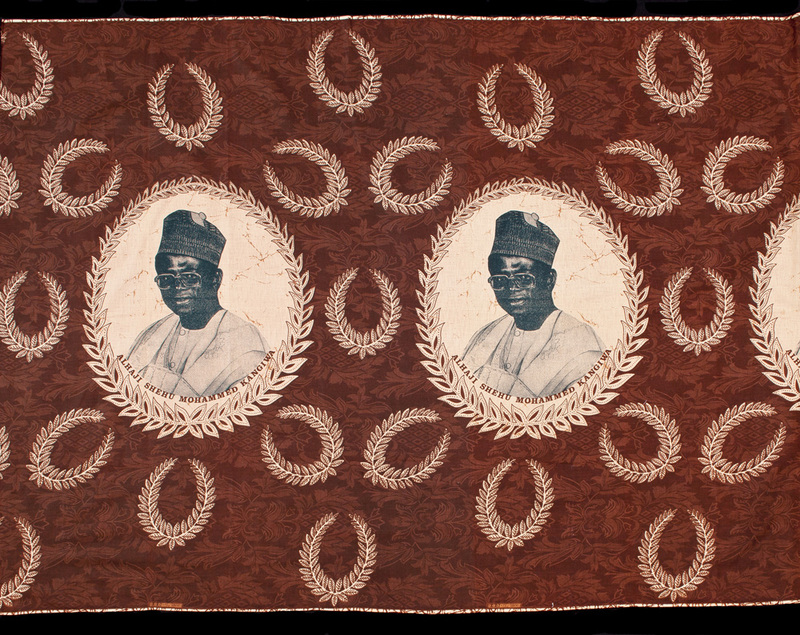 Above: Unknown, Portrait of Alhaji Shehu Muhammad Kangiwa with Olive Leaf Wreaths, Burkina Faso, late 20th century. Factory printed cotton. 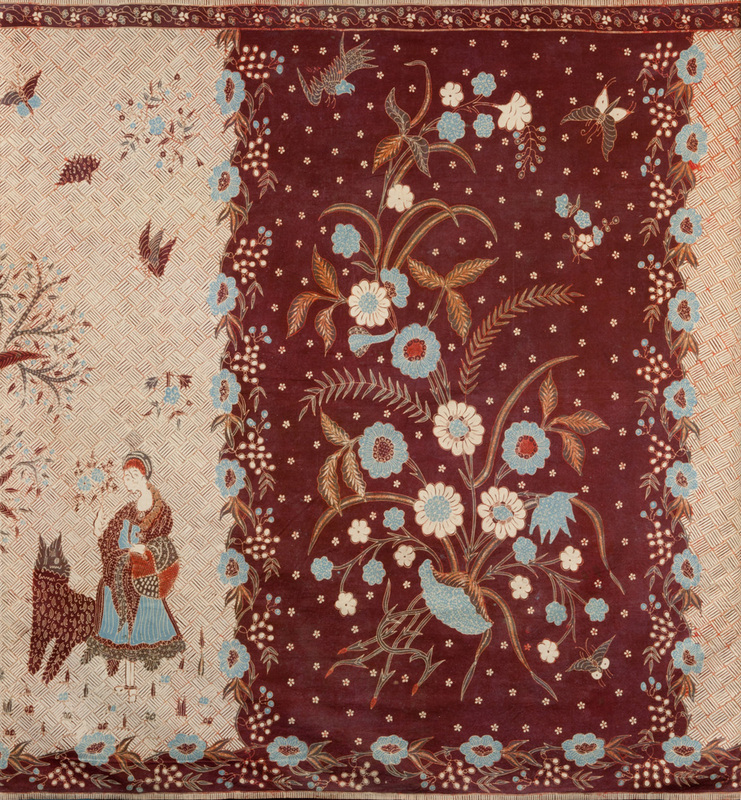 Newark Museum Gift of Jo M. Sullivan, 2014. By presenting artworks that span centuries and continents within the context of the Five Pillars, Wondrous Worlds: Art & Islam Through Time & Place provides Museum guests with the opportunity to experience the living legacy of Islam through an in-depth examination of the religion’s global reach and influence across generations. Over the course of the exhibition, the Museum will present various public programs inspired by the artworks on view, including public lectures featuring local Muslim leaders and family-friendly activities in the galleries, to help build awareness and engage the community in conversation about the world’s fastest growing religion. 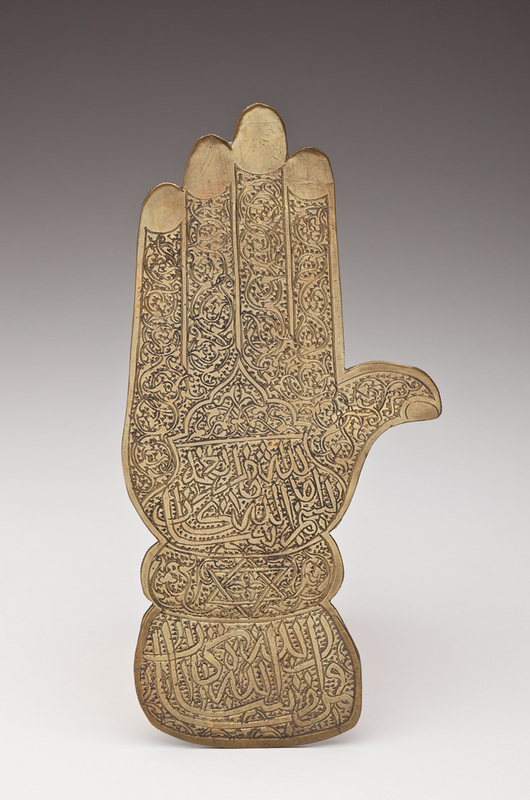 Above top: Unknown, Inscribed in Thuluth Script, Hand of Fatima Charm with Six-Pointed Star, Algeria/Morocco, before 1928. Brass. Newark Museum Purchase, 1928. 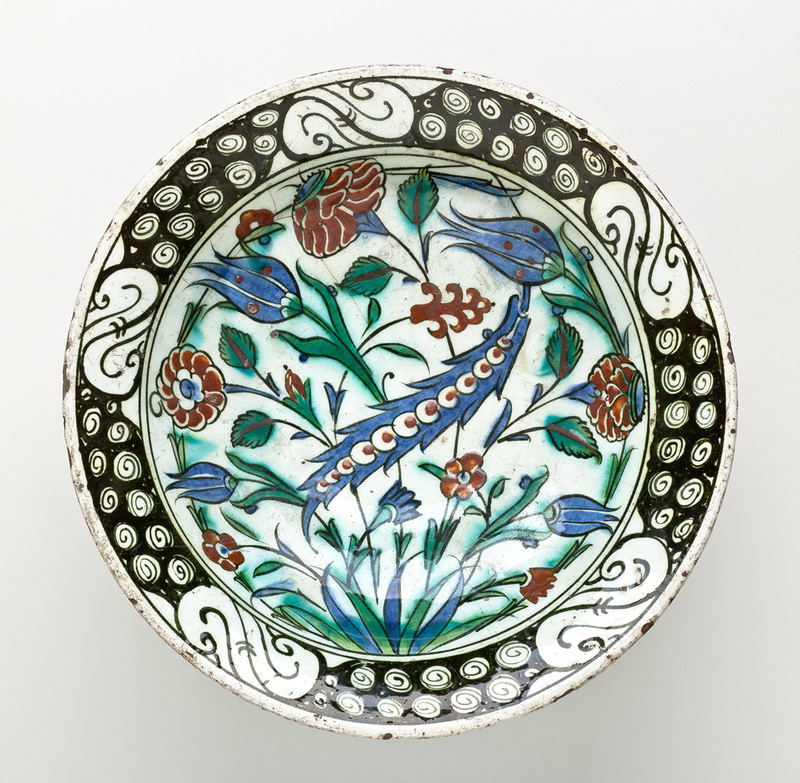 Middle: Unknown, Red Carnations, Blue Tulips and Blue Saz Leaf on a Dish with Flower Petal Rim, Iznik, Turkey, 18th century, Ottoman Period (1299–1922). Fritware polychrome painted over white slip under transparent glaze. Newark Museum Purchase 1929. Bottom: Unknown, Portfolio with Eight-Pointed Star and Geometric Motifs, Algeria before 1928. Leather, gold. Newark Museum Purchase, 1928. Thursday, January 24, 6 p.m.
Members of the Circles of Support of Phoenix Art Museum enjoy hors d’oeuvres, live music, and remarks from Janet Baker, PhD, the Museum’s curator of Asian art, followed by an exclusive preview of the exhibition. More information here. Friday, January 25, 10 a.m.
Phoenix Art Museum Members are invited to an exclusive, Members-only viewing of the exhibition Wondrous Worlds: Art & Islam Through Time & Place before it opens to the public. More information here. Members are invited to an exclusive viewing of the exhibition before it opens to the public. More information here. Join us on First Friday to experience Wondrous Worlds: Art & Islam Through Time & Place and in- gallery programs inspired by the exhibition. This event is open to the public with voluntary- donation admission. See phxart.org/events/calendar for event information. Don’t miss Wondrous Worlds: Art & Islam Through Time & Place during voluntary-donation times on the second Sunday of each month! Guests will also enjoy exciting activities, scavenger hunts, live performances, story time, free tours, and more. See phxart.org/events/calendar for updates as information becomes available. See phxart.org/events/calendar for event information as it becomes available. Youth ages 4 to 7 are welcome to participate from 10:30 am to noon, and youth ages 8 to 12 are welcome to participate from 2 to 4 pm in the Education Studio. See phxart.org/events/calendar for event and ticketing information.